Infrared radiation (IR) represents more than 50% of solar radiation. Representing more than half of the rays emitted by the sun, our skin is exposed daily to infrared radiation (IR). Now identified as a major contributor to photo-damage, specific strategies to keep away IR are needed to achieve a complete and complementary protection to UV. What does Infrared / UV radiation do? IR radiation induces an increased amount of ROS by targeting the mitochondria, whereas VENUCEANE™ reduces it by 28%. 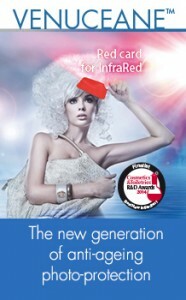 By giving a Red card to InfraRed, Venuceane™ fights IR-Ageing. Venuceane™ adapts to the skin’s new fight against photo-ageing. Contact [email protected] to request for a copy of this presentation.